Welcome to Friday's Fave Five everyone! It's a place to share our blessings from our week. Take a look back over the week, whether it was good or bad, and look for those moments that bought joy. 1. Inspirational Movies such as "Gifted Hands". I knew about Dr. Ben Carson after seeing him do several interviews years ago but hadn't realized they had done a movie about his life and work. An amazing man, with a deep faith in God, who just happens to be the world's best pediatric neurosurgeon. His story is absolutely inspiring as he was bullied as a child and thought himself as stupid as a youngster, always receiving failing grades. Cuba Gooding Jr. is one of my favorite actors and he played the doctor wonderfully which was just icing on the cake for this movie for me. It's a great show to watch with your preteens and teens. Now I, of course, want to read his book. 2. Gold Kiwi. From New Zealand. 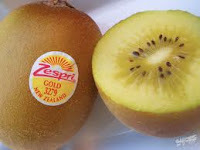 Gold flesh, not as fuzzy, super sweet and more of a delicate taste than regular kiwi, it is absolutely yummy. But at twice the price of the regular, it was a once in a blue moon treat. 3. Touring the showhomes. It's a tradition, every year my friend and I pick a night or two during the fall 2 week showhome tours, jump in one of our vehicles, grab a Starbucks and head off to look at some amazing homes. Everything from high end, upgraded everything, million dollar executive homes to regular family homes. It's a fun way to spend an evening doing something we both like, and it's free. I decided I really like medium brown maple kitchen cabinets, curved staircases, and I really hate the super upraised sinks (I'm talking a good 6 or more inches, I have visions of knocking my teeth out on the edge of them when I would sleepily bend over to wash my face in the morning) which seem to be all the rage this year. It's fun to look at the "in" colors, the new gadgets, the designs, and all the "newness" but at the end of the day, I am thankful for my home that I get to come home to. 4. The Sing Off started it's new season. Love this show! I've always loved accapella and harmony and this competition brings the most amazing talented singers. I cannot believe they don't use one instrument and it's all voices. It makes me wish I could sing. Even a little bit. 5. It's Friday. It's soon the weekend. Yup, I like that. What are your favorites from the week? Look for the blessings and share them with us. That movie sounds wonderful -- thanks for the recommendation! Interesting trends in home details. And a fun yearly tradition with your friends. I would love to do a touring in houses ! Must be interesting ! I thought of Friday the same way today. Touring showhomes sounds like something I would have fun doing! great list of faves, susanne! the tour of show homes sounds fun..i'd probably covet so much though! lol....never heard of the movie..will have to look for that one for the winter months. and that kiwi! i didn't know there WAS such a thing...i've always just seen the regular green kind which we LOVE but it is pricey right now..then again what isn't?? Ben Carson was the graduation speaker when one of my sons graduated from college. He's good. Love the way he talks about the mother-son bond. I love the Sing-Off. One of my very favorites! Enjoy your weekend, Susanne. The movie sounds great. I'm going to look for it through Netflix. Two of my favorite shows started back this week, too. Have a good weekend, Susanne! Ohhh Gold Kiwi sounds intriguing...the fuzziness on kiwi makes me shiver lol...I am loving that it is Friday too! Enjoy! Loved the movie and the book! I love The Sing-Off, too. I'm glad they're giving it more time this season. I don't think I ever thought of touring show homes. When we were house-hunting last summer, we saw some newer homes with newer features. Our realtor said the new trend is those higher sinks. I wasn't sure if I liked them or not. But I liked that one bathroom had two sinks, one regular height and one higher. I've been longing for a master bath with two sinks, and it seems ideal to try one of the higher ones while you've got the regular one there, too. Unfortunately, that was only one of the things we liked about that house, so we didn't pursue that one. I didn't get around to making a list this week (took too long on the Fall Into Reading list--ha), but I would add The Sing-Off to my faves this week too. I love clean shows that showcase artistic things. Watch next week for Messiah's Men. I've heard them twice and they are phenomenal. They are 8 men from Africa, trying to make a better life for themselves. I expect them to go far in the competition! I have looked forward to the Sing-off since it ended. I too love the sound of acappella, so rich and beautiful. I don't think we get the full benefit of the sound from TV unless you have surround sound. But it is still great! Love the idea of checking out the model homes with a friend and a speciality coffee. I think I am going to copy your fall tradition. kiwi fruit grove. I recorded some of it on my camera's video. That's where I saw and tasted the gold variety. Tasty. I thought they were only sold in NZ. I will check my market to see if I can buy some. I would love tour showhomes, too. Think of the ideas you could get! I'll definitely watch for that movie. Dr. Ben Carson sounds like a wonderful person. My husband and I like doing home tours too. My daughter and husband are following The Sing-Off. I'm watching the X factor purely for the "joy" of seeing Simon. I have a few friends who live in those kinds of houses....looks too much like a museum to me and not cozy at all. Our home is comfortable, cozy and very lived in and I have a hard enough time keeping it clean. Friday is a blessing, isn't it. Honey Bear is home after 3 days away for work. I love to look inside other homes, too. I also like to take our city's special tour of the historical homes at Christmas time, for another perspective. I love the new "House Beautiful" decor, I also enjoy the antiques. I have design confusion. I was definitely ready for Friday this week! Thank you for another week of FFF! Anyway, after watching the pilot we decided we won't follow it. Your "Gifted Hands" sounds much better! And, I love home tours, only they are usually the showcased builders dream homes so it can make me a little materialistic. But like you, I am alwauys glad to come home to my happy, warm & loving home. I've never seen Gold kiwi before but I will be looking for them now! I love looking at show homes too, they always give me ideas for decorating in my own home and I just like to know what is out there. I've heard of that movie - now I really want to watch it! Touring the showhomes sounds like great fun.